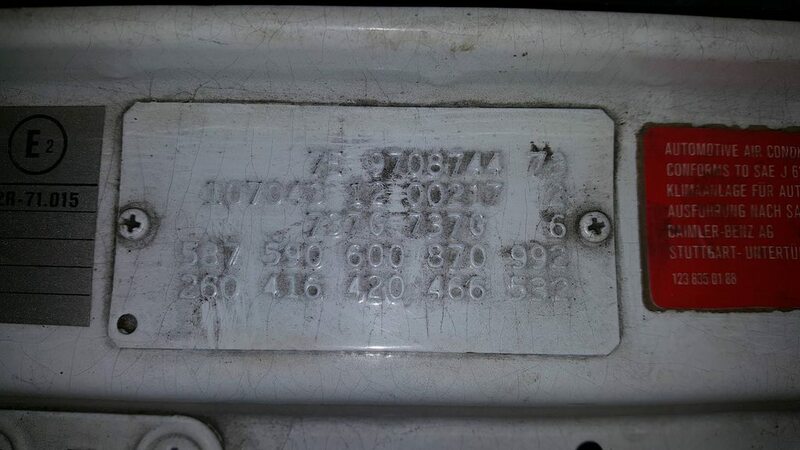 I recently got a 1979 350SL and it has option code 992 stamped on the dataplate. I know that it means that the vehicle has some special order options, but this option does not appear on the datacard. I have the original datacard and there is no mention of it. I contacted Thomas from the Classic Center hoping there would be a production order in their archives, but they also only got a datacard with no mention of the code 992. Yes,I have seen it quite often and it means that options not listed on the data card have been added. On my 6.3 I found out it had an extra large radiator .Pretty odd considering it was delivered new in London ( Fish Lane ) where it isn't exactly Tropical. I can only assume it was ordered by the 1st owner who was intending to bring the car here to Australia. Has your car VELOURS interior ????? On the datacard is marked Ausstattung : --- and with pen is written 905 ??? Code 992 : FOR FURTHER NON-CODED SPECIAL VERSIONS, SEE PRODUCTION ORDER I, but that is in this case a special Client Wish for which the body had to be special extra prepared. Does the option code 992 appear on your datacard? Do you have the production order explaining the non-coded options? It was originally velour, but it was reupholstered in leather. The door panels still got velour inserts. 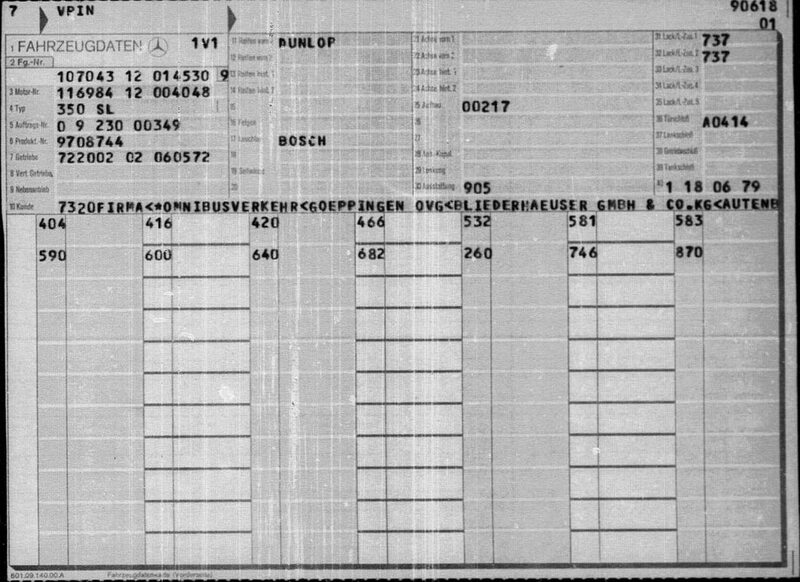 I'm not sure why there was a mistake on the service book datacard, but it is not present on the datacard from the archives. Still confused why there is a 992 code on the dataplate and it is not present on either of the datacard and there is no production order in the archives for this vehicle. There is code 590, which means heatisolating green glas around in combination with heated rear window in your hardtop. That last option needed extra drilling for the electric connection. It could be that that body- / hardtop- option is ment by the 992 code. 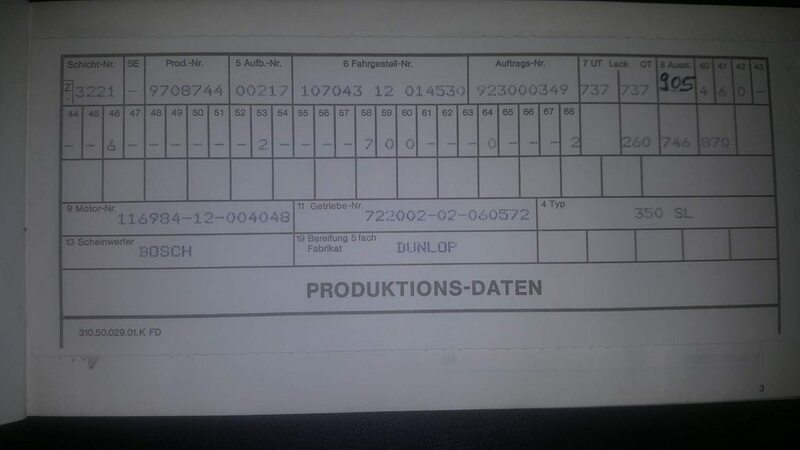 There are more cars for which the productionpage I is not anymore available in the Benz archives �..
the optioncode 993 is marked on my datacard in the field "Hinweis" which is not on your datacard mentioned. Wow, a 107 SL with velour interior. 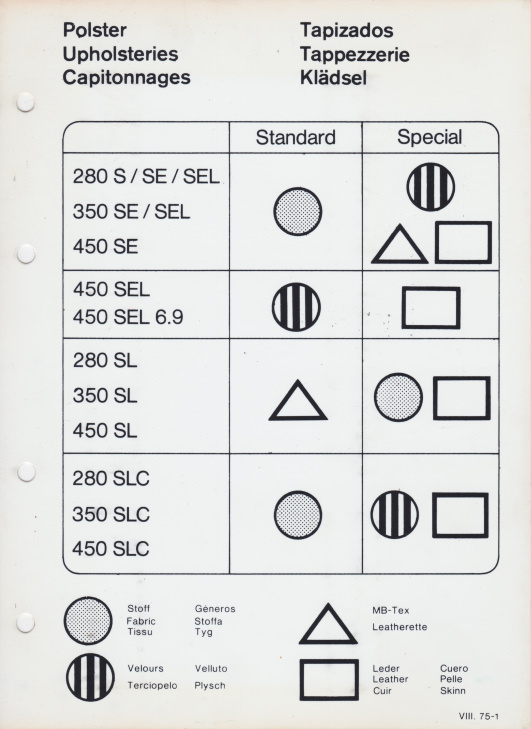 The SLC was available with velour but not the SL to my knowledge, so this had to be a special order and probably the reason for the written in number on the card and possible the 992 but that still doesn't explain why it's on the body tag and why it's not indicated on the datacard. I don't think there were any body shell components affected by the upholstery material. 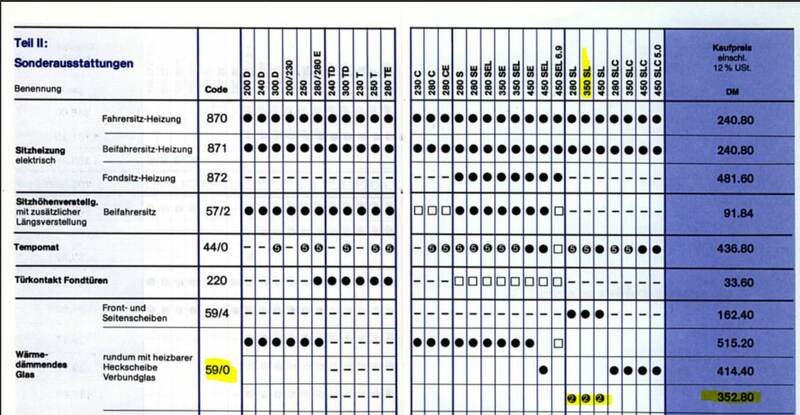 But the option 590 is marked on the dataplate and on the datacard, and it's a pretty common option so I doubt it would require a 992 code. I think we got a winner. Velour was not available on the R107 SL. Now I wish it still had the velour interior Still wonder why 992 is on the dataplate since upholstery is never mentioned on it. Maybe there is more to this car. Hardtop had to be ordered extra and was imho not standard delivered. Neigther was a hardtop with heated rear window �. The code for heatisolating glas for the SL-serie was normaly SA-code 594 "Waermedaemmendes Glas gruen fuer Seitenscheiben und Windschutzscheibe (SL = OHNE COUPE-DACH UND FAHRGESTELLE)" and NOT code 590 which was for the sedan cars �. SA-code 41/6 means ordered hardtop mounted and not in a box delivered (uncolored glasses with heated rear window) �. SA-code 41/6 means ordered hardtop mounted and not in a box delivered �. Are you looking at it correctly? which code is mentioned in the red marked position ??? My eyes are good , although with glasses �. Footnote 2 means "nur lieferbar mit Coup�dach". Meaning option 59/0 can only be ordered with the hardtop (code 41/6). I'm not sure where you see that it's a special request option. I see where the confusion comes from. The line under the 59/0 code is just a formatting error on the website's part. Now code 59/0 is mentioned on your dataplate in combination with code 41/6, I have to conclude that I did read that Preislist wrong �. But in that case code 992 is not explained �. Has your hardtop the chromed rails for connection of the ski-holder or Luggage rack ? ?